There are three factors involved when we talk about restoring or maintaining health, it is a triad symbolized by an equilateral triangle. If one side of the triangle is ignored, health is diminished and can lead to a significant health problem. As a doctor of chiropractic using applied kinesiology to evaluate body function, I have a special interest in carefully observing all side of this triangle so that a patient can be evaluated and treated successfully. 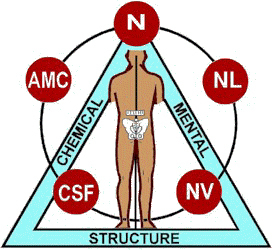 The three parts of this equilateral triangle or triad are Structure, Chemical and Mental. Structure: Chiropractic is the major healing profession dealing with the triad’s structural base. Chiropractors using applied kinesiology not only deal with the spine but also with the joints and muscles of the body. Structural changes (especially of the spine) may compromise the spaces that nerves must transverse, causing nerve entrapment. Nerves are a major form of communication in the body; muscles, organs and glands may not function correctly if there is nerve entrapment. Lymphatic flow and vascular flow can also be entrapped. Body pain and numbness, lack of energy, general malaise, decreased immune and organ function are possible signs of a problem with nerve, lymphatic or vascular flow that started with a structural problem. Muscle weakness and imbalance can increase the structural instability which is compromising nerve, lymphatic and vascular flow, thus forming a vicious circle. Chemical: The allopathic medical profession attempts to control body dysfunction via prescription drugs; unfortunately most drugs only mask symptoms and do not cure and in addition can cause dangerous side effects. In holistic professions such as chiropractic, nutritional deficiencies are included in the chemical side of the triangle. Malnutrition is an increasing problem due to refining of foods, addition of toxic chemicals, increase in pesticide use, dietary indiscretion and the depletion of the soil in which food are grown. Malnutrition is insidious in nature, often not resulting in a classic malnutrition disease but causing a general health loss. Along with physical examination and tests, nutritional supplements can be tested by having the patient chew the supplement and see if it is needed. Certain foods such as wheat or diary can also be tested to see if the food is harmful as in food allergies or sensitivity. Mental/Spiritual: We all know that a person’s mental attitude affects their health. A headache can precede a stressful situation such a job interview or a family gathering. A patient who suffers from chronic fatigue can start to believe that they will never get well and constantly sends negative impulses via their thoughts to their brain and nervous system causing a vicious cycle. Mood swings or depression can be the result of low blood sugar, low omega 3 fats, or too much of the wrong nutrition, for example. Postural changes such chronic tight trapezius muscles caused by stress can affect how well a person feels. The sides of the triad or equilateral triangle interact with each other. For example, when there is constant structural strain it can affect a person’s emotions. Emotions affect the normal digestion of the food a person eats or the person eats too much sweets due to their emotions. Due to this the chemical side of the triangle becomes involved and a nutritional deficiency develops which may develop into muscle weakness or spasm that increases the structural strain tus completing a vicious cycle. As a doctor of chiropractor and an applied kinesiologist, one can evaluate and treat all sides of the triangle. One can correct structure and nerve function to effect better support and control of a patient’s health. The triad of health can be tested via the patient’s own body to determine the effect. Emotional and anxiety reactions can be improved by positive feedback and emotional release techniques and with working with the other two sides of the triangles. The interplay between parts of the triangle affects many aspects of health and affects the ability of an holistic doctor to treat the WHOLE PERSON. This entry was posted in Uncategorized and tagged 10011 applied kinesiologist, 10011 chiropractor, 10014 applied kinesiologist, 10014 best chiropractor, 10014 chiropractor, 10014 neurokinetic therapist, 230 w 13th st. ny 10011, 455 W. 23rd St NYC 10011, applied kinesiologist, Applied kinesiology, applied kinesiology practitioner, best applied kinesiologist, best chiropractor, best nyc applied kinesiologist, best nyc chiropractor, best woman applied kinesiologist, chelsea applied kinesiologist, chelsea chiropractor, downtown applied kinesiologist, downtown chiropractor, downtown manhattan applied kinesiologist, downtown nyc applied kinesiologist, Dr. Vittoria Repetto, http://www.facebook.com/pages/London-Terrace-Chiropractic-Applied-Kinesiology/109622855768202, london terrace chiropractic, london terrace chiropractic & applied kinesiology, muscle testing, neuro-vascular, triad of health, west village 10014 chiropractor, west village applied kinesiologist, west village applied kinesiologist nyc, west village chiropractic, west village chiropractic nyc, west village chiropractor, west village neuro kinetic therapy, woman, woman 10011 applied kinesiologist, woman 10011 chiropractor, woman applied kinesiologist, woman chiropractor, woman nyc chiropractor, www.drvittoriarepetto.com, www.drvittoriarepetto.meta-ehealth.com, www.twitter.com/drvrepetto. Bookmark the permalink. Hi Dr. Repetto, I used a triad myself quite unconsciously in 1986 to gain remission from the description severe ‘ocd’. I used affirmations (for the mind), nutrition (for the body) and aerobic exercise (for the breath, spirit) and gained remission i.e. on No Medication and No Symptoms of the description ‘ocd’ within 6-8 months. Used concepts quite consciously beginning in March 2013 plus forgiveness and got well, thank goodness.